Welcome back. You may not have been away, but I have — sort of. I didn’t actually go anywhere. As I prepare for my triumphant return to blogging about minimalist living and simple, deliberate lifestyle choices here at So Much More Life, I thought you might like to know what I’ve been doing this summer — and what you missed if you were also away from your computer recently. I’ve been writing more than ever recently, although I can’t prove that too you. Much of my work has been text for writing clients who needed to enhance their websites, blog posts for clients who needed some help saying things well or other bits of writing to fill gaps in the world. I’ve also been writing posts aimed at making money online in various ways, but most of those are published under other people’s names or with no name at all, so you won’t hear much from me about that topic. In addition, I’ve written some stuff that you will find under my name but in other locations, and I’ll tell you more about those projects in a future post. For now, however, let’s concentrate on So Much More Life. Simple Living: Who Are The Relevant Voices Today? How Do You Get Back On Track When You’ve Drifted? I hope these gives you something from me to chew on until I return to regular blogging. In the meantime, keep looking for ways to simplify your life. My life has had some challenges in recent month — mostly financial — but things are looking up. Looking up, in fact, is good advice no matter your situation. If you read my posts on the site instead of by email or RSS, you might have noticed that the tagline for So Much More Life has changed. The new tagline — “Don’t be silly. 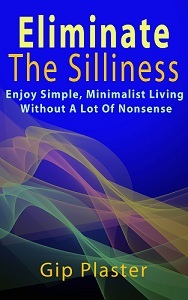 Be simple.” — is actually based on a suggestion from Robert Wall of Untitled Minimalism, a longtime blogging friend. I don’t suppose he was serious when he suggested “don’t be silly” as a tagline for this blog, but he recognized my dislike for the sillier things in life, and his suggestion didn’t seem silly to me at all. I recognize silliness when I see it, but this tagline is brilliant. The new tagline isn’t silly at all, Gip. It’s great. I’m looking forward to reading about your other projects. Thanks, Mike. And more about some of the other projects is coming next week. Your post about supporting your RV lifestyle is great, by the way.